The Plaza District Association will host the 2009 Plaza District Festival on Saturday, October 3rd from 3-11 PM. The festival highlights a wide array of performing artists, visual artists, live musicians and interactive art education. The festival is open to the public drawing audiences from across Oklahoma City and the surrounding areas, and offering the surrounding neighborhoods an arts festival right in the heart of their community. A grand stage set in the center of the Plaza District provides performing artists a space showcase their talent. In evening, kick back and enjoy 4 spotlight bands from the Oklahoma City music scene with the Plaza District Music Fest! We hope you can make it! Check out the Call to Artists and Application here! 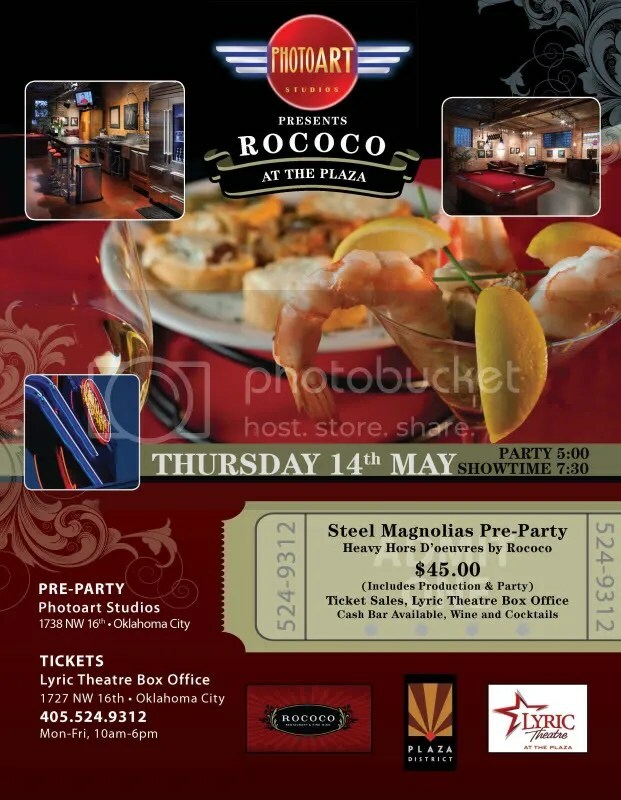 Rococo is proud to announce the Partnering of PHOTOART Studio and Rococo in the Plaza District! We are kicking off the news tonight at Urbanity being held at the Velvet Monkey tonight from 5:30- 7:00! We will be doing private dinners, cooking classes, and parties to support the Lyric and the Plaza District as a whole. We are very proud and excited here at Rococo to be joining K.O. Rinearson, PHOTOART and becoming part of the Plaza District Family! Plaza District is so excited about this awesome event and partnership!! Adult/Kid Easter Art Hunt, Featured Artist Josh Heilaman, Lyric’s Woody Sez, deadCENTER Short Suite Screenings, live music, outdoor art booths, open houses, live puppetry, featured designer Birdie, free ballroom dance lessons and much more! The Plaza District’s LIVE on the Plaza Second Friday Artwalk blooms a packed schedule and fine introduction to spring. 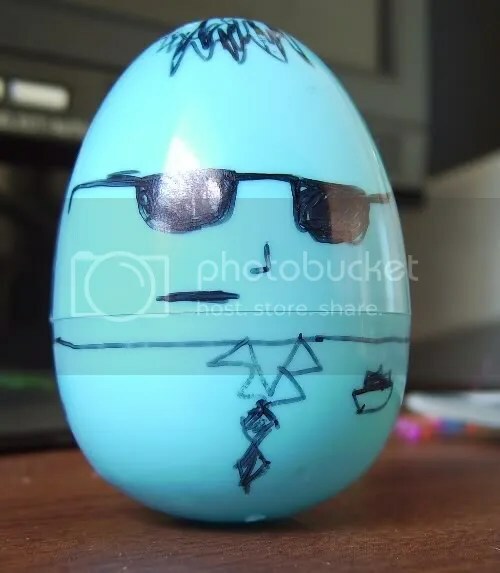 Eggs a-LIVE will start at 7 PM, allowing kids and adults yearning to act like kids- a chance to hunt for eggs full of unique Plaza District prizes. Some prizes include: a free kids craft kit, original artwork from DNA Galleries, handmade items from Collected Thread, gift certificates, kids dance lessons, candy, toys and more! Please find the Plaza District info table across from Lyric Theatre to start the hunt! Featuring a question and answer period with veteran racer and professional editor, Beau Leland, attendees will lean about the specific and complex components to entering, and winning a film race.Screening will be Team Awesome’s Misscommunication, Team Monkey’s The Public View, and Team Pick Six (Minus One) with Special Delivery which won the Videophile award at the 2009 video race in February. 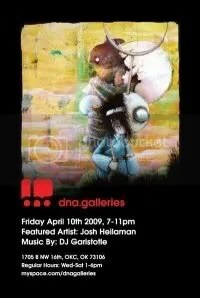 Be sure to stop by DNA Galleries where Josh Heilaman has returned to OKC to show his latest work. Josh’s work in a variety of media, create environments heavy with seas, forests, and cities – all populated by creatures of whimsy and all expressing the multitude of emotions we as humans face today. From contentment to struggle, adornment to loneliness, Josh’s work gives us a glimpse into ourselves through his use of color and whimsical creatures. DNA Galleries has also worked with Josh to produce the first in a series of local artist limited edition T’s and will be releasing these to the public during the exhibit. Also beats by the favorite DJ Garistotle will be playing outside! Birdie designs, live puppetry and more! 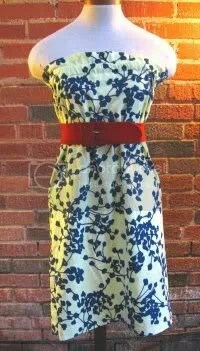 Next door, check out the clothing and accessories by designer Birdie, plus more handmade accessories, vintage clothes and art at Collected Thread! Then, head over to Performance Dancewear for free ballroom dance lessons. Paula and Co Realtors will be throwing a Plaza District ho-down with great music, food and fun! Come see the renovation of live/work artist spaces at 1710 NW 16th, an open house with refreshments and visual artists. At 8 PM be sure not to miss the Balcum Rancum Live Pupptery at Bad Grannies Bazaar. Last month, Balcum Rancum told the story of “The Largest Mermaid”, so tune in this month to see the latest story! Visual Artist and Indie Craft artist will be displaying works in booths outdoors as well! Also, Lyric at the Plaza will be showing “Woody Sez” at 8 PM. Lyric’s production of Woody Sez is the American premiere of a musical that met with rave reviews and delighted crowds across Europe! This gem of a show weaves the songs of Woody Guthrie together with excerpts and anecdotes from his writing to transport the audience through his fascinating, beautiful, and sometimes tragic life. Performed by a talented group of four versatile actor/musicians who play 15 instruments ranging from guitar and fiddle to jaw harp and dulcimer, the show brings to life the many people who are the fabric of Woody Guthrie’s amazing story. The cast’s infectious enjoyment, Woody’s incredible journey, and a stirring mix of moving ballads and energetic foot-stompers, including “This Land Is Your Land”, “Oklahoma Hills” and “This Train Is Bound For Glory”, all create a truly personal portrait of an Oklahoma legend and one of the world’s immortal troubadours. Check http://www.lyrictheatreokc.com for more showtimes! deadCENTER in the Plaza District! Featuring a question and answer period with veteran racer and professional editor, Beau Leland, attendees will lean about the specific and complex components to entering, and winning a film race. “The film race is the first thing Team Awesome – which created the feature “Rainbow Around the Sun” – ever did. We had to have a team name to race, so we chose ‘Awesome.’ From that experience, we knew we had to keep working and writing together – the film race keeps us on our toes, creatively,” continues Leland. Screening will be Team Awesome’s Misscommunication, Team Monkey’s The Public View, and Team Pick Six (Minus One) with Special Delivery which won the Videophile award at the 2009 video race in February. The XO Lounge, which hosts the monthly event, will continue to run beer and drink specials for the screening on Wednesday, April 1st. Doors open at 8:15pm and the program begins at 8:30pm. Must be 21 to enter. The LIVE on the Plaza screening will be at PhotoArt Photography Studio at 1738 NW 16th St. in the Plaza District. Doors open at 7pm and the program begins at 7:30pm. These events are free and open to the public. Below is the press release for the 2009 Urban Pioneer Awards! We are so pumped to not only honor our awesome former city councilwoman–but to do it at RED Prime Steak!! RED is a great sponsor of the event and Plaza District, and we look forward to hosting our event in their cool showroom upstairs! Oklahoma City, Oklahoma, April 2nd, 2009 – The Board of Directors of the Plaza District Association is pleased to announce that former Oklahoma City Councilwoman Ann Simank will be the recipient of the 2009 Urban Pioneer Award. The award is given each year to an individual in Oklahoma City who exemplifies Oklahoma’s pioneering spirit with their leadership and their commitment to urban revitalization. The 2009 Urban Pioneer Awards Luncheon will be held Thursday, May 14th from 11:30 to 1:00 PM at RED Prime Steak in Oklahoma City. Meg Salyer, recipient of the 2007 Urban Pioneer Award, will serve as the event emcee. “Ann has been a long-time supporter of ALL of our inner city” continued Kristen Vails, Executive Director of the Association. “Her leadership has been instrumental in the redevelopment of Stockyards City, Automobile Alley, Midtown, the Medical District, and St. Anthony Hospital – just to name a few”, she continued. The Plaza District Association has adopted the term “urban pioneering” to describe its work in inner city revitalization. Fueled by creativity, over the last several years the Plaza District has emerged as an exciting new destination for arts and entertainment. The district’s transformation has been driven by the collaborative efforts of neighbors, business owners, property owners, volunteers, artists, City staff, and the Oklahoma Main Street Program. Past honorees include: Dr. Tom McDaniel, President of Oklahoma City University, honored in 2005; Mrs. Lou C. Kerr, visionary leader in the Plaza District and all the arts, honored in 2006; Mrs. Meg Salyer, pioneer in the transformation of Automobile Alley and invaluable Plaza advisor, honored in 2007; and Mr. Mark Funke and Mr. Mike Turpen, leaders of Lyric Theatre’s highly successful $10 million capital campaign, honored in 2008.